Economical ratio 1:5000 To -30 degrees F.
ZP-510 Freeze-Zone-40 is a corrective treatment for low temperature gel problems with #2 diesel fuels and other middle distillates. ZP-510 Freeze-Zone-40 will reduce the pour point for less cost than fuel blending methods. How It Works: ZP-510 Freeze-Zone-40, our Anti-gel formulation insures fuel flow to -40° F and works as follows: ZP-510 Freeze Zone-40 is formulated with a high concentration of hydrogen/oxygen atoms which modify wax crystal sizes and retards the formation of the wax lattice network. It also affects the wax crystals’ ability to adhere to each other or to other materials, including filters, seals and metals. Thus at low temperatures, fuel is able to flow, remain free of wax, and narrow clearances stay open. Fuels having poor cold weather flow properties cause serious problems in diesel powered vehicles, generators, and oil fired furnaces and boilers. Growth of wax crystal lattices at low temperatures is the basic cause of flow problems in distillate fuels. Such growth depends on factors such as quantity of wax in the fuel, molecules weight of the wax, temperature, quantity of water in the fuel, time, and fuel hydrocarbon balance. At low temperatures, wax will crystallize and agglomerate into a lattice network, which will trap oil and water, causing the fuel to gel. The temperature at which wax crystals first appear is the “cloud point”. The temperature at which the gel prevents the fuel to flow is the “pour point”. At some intermediate temperature, the wax crystals will adhere to filters, and other narrow clearance in the fuel system and restrict or prevent fuel flow. What To Expect: Since diesel engines normally develop more power and get better mileage with #2 fuels, it is to the operator’s advantage to use the #2 grade both winter and summer. Using ZP-510 Freeze-Zone-40 allows diesel engine operators to lower their winter operating costs by using the #2 fuels instead of the blended fuels. Also, it helps to avoid fuel system maintenance plus, equipment downtime related to fuel problems. Treatment of storage tanks with ZP-510 Freeze-Zone-40 is simple and easy. It mixes readily with the fuel. The ideal method is to add ZP-510 Freeze-Zone-40 just before fuel delivery. Treatment of a vehicle fuel system is also simple and easy - just add the specified amount to the vehicle fuel tank prior to refueling. Over-the-road trucks can carry sufficient highly concentrated ZP-510 Freeze-Zone-40 to last until they return to their base. Uses: ZP-510 Freeze-Zone-40 is recommended for all #2 diesel and middle distillates fuels. ZP-510 Freeze-Zone-40 can be adapted for use in heavier fuel oils to control or prevent flow problems at low temperatures. 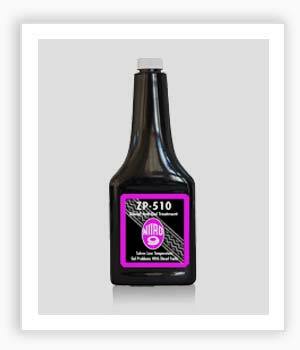 Applications: ZP-510 Freeze-Zone-40 is recommended for treatment of #2 fuels for all diesel engines. This product does not add to combustion residues since it does not contain ash. It is not harmful in any home heating systems when utilized to avoid low temperature flow problems. Note: The user is advised that some diesel fuels may be harder to treat than others and that this schedule is to be used as a guide for normal, middle distillate fuels. Some countries have waxy diesel fuels that require special blending, such as China and Russia. Supplying this office with samples will determine the formulation. For best results, ZP-510 should be added prior to refueling and just before cloud point has been reached. Directions: For best results, use in the main storage tank.